Though the world appears to change at a breakneck pace these days, our vision of what is beautiful appears to be timeless. Witness this fine urn, filled with a spray of lovely fresh flowers. The chrysanthemums and other flowers are in full bloom and will fill any room with a cheery, abundant wealth of beauty that only nature can provide. The arrangement is set against a forest of dark green trees, with just a small opening of light to provide focus and direction. The Grecian style urn appears to rest on a windowsill, beckoning the light to glisten on the petals of the blooms. With Magnificence, spring is always in bloom in your home. Magnificence comes with a tunnel for easy hanging and is fully lined. Note: tapestry rod and tassels, where pictured, are purchased separately. 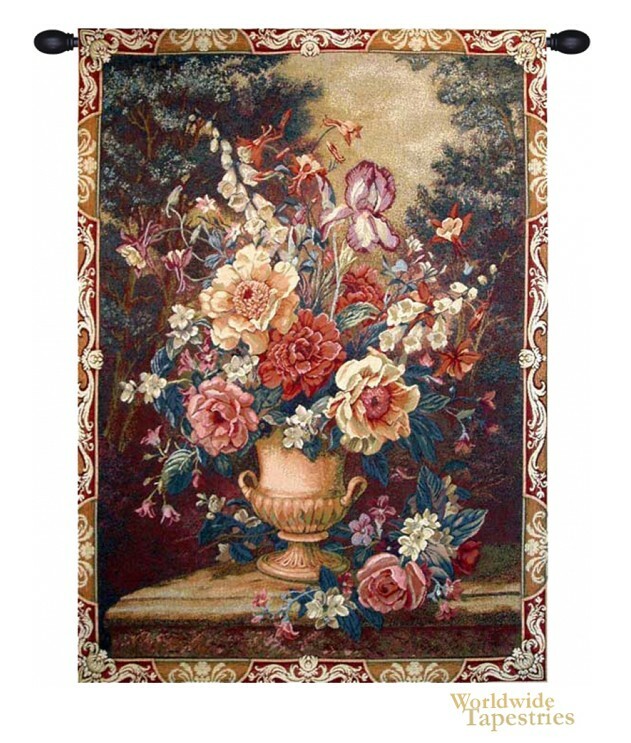 Dimensions: W 24" x H 35"